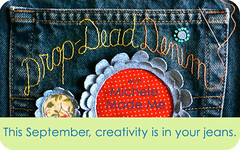 I'm guest posting over at Michele Made Me today as part of Michele's Drop-Dead Denim event, a month-long celebration of denim specifically focusing on recycling old jeans. 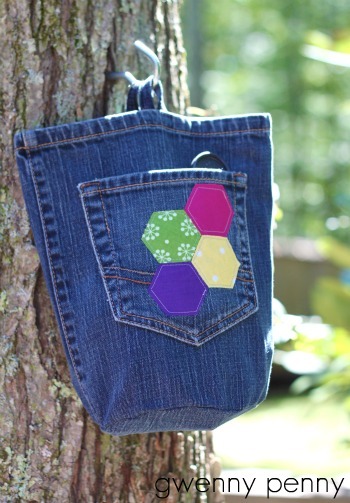 Today I'm sharing a tutorial on how to make a round-bottom clothespin bag. Very cute!!!! Thanks for sharing. I did love my 241 bag that Gwen made me. I immediately transferred everything from my purse to my new bag. Blue is my favorite color so it is perfect. Yeah!!! how fun. I absolutely love cothespine bags. This is such a great project. The bag is cute Gwen! I love the hexes you used- and the story about the squirrels? Hilarious. I am following this series in Michelle´s blog, and your projet is one of my favourites!! !